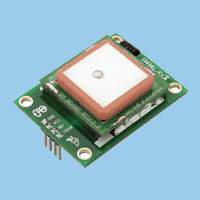 Low cost, dual-axis thermal accelerometer capable of measuring dynamic acceleration (vibration), incline and static acceleration (gravity) with a range of ±2 g.
Measure 0 to ±2 g on either axis, Fully temperature compensated over 0° to 70° C range, Simple, pulse output of g-force for X and Y axis, Analog output of temperature (Tout pin), Low current operation: less than 4 mA at 5 vdc. Dual-axis tilt sensing for autonomous robotics applications. 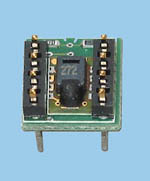 The Tri-Axis Accelerometer is an integrated module that can sense gravitational(g) force of ±3g on three axes (X, Y, and Z). The module contains an onboard regulator to provide 3.3-volt power to the sensor, analog signal conditioning, and a four channel, 12-bit analog-to-digital converter to read the sensor voltage outputs. Acquiring measurements from the module is simplified through a synchronous serial interface for simple connection to microcontroller host. Free-fall output indicates simultaneous 0g an all axes. Does your project need to be able to track its position globally? When used in an outdoor environment, the GPS Receiver with its integrated patch antenna can provide standard raw NMEA0183 strings or specific data from up to 12 satellites via a standard serial interface. The module provides current time, date, latitude, longitude, altitude, speed and travel direction/heading among other data, and can be used in a host of applications, including navigation, tracking systems, mapping, fleet management and robotics. This device can be connected to a PC serial port using a MAX232 line driver. 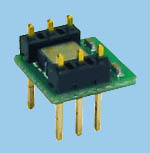 Single-wire 4800 bps TTL Serial interface to Microcontrollers. Provides either raw NMEA0183 strings or specific data, making it easier to use on the microcontrollers. Simple/raw mode selectable via I/O control. Sensitive to microtesla (µT) variations in magnetic field strength. Simplifies direction by resolving magnetic field measurements into two components axes. 6-bit (64-direction) resolution after calibration. Only 30 to 40 ms between start measurement and data-ready with simple synchronous serial interface. Built-in resistor protection for data pins eliminates bus conflict risks. Compact and breadboard-friendly 0.3 inch, 6-pin DIP package. Audible compass for the vision impaired. The sensor measures distance using sonar; an ultrasonic pulse is transmitted from the unit and distance-to-target is determined by measuring the time required for the echo return. 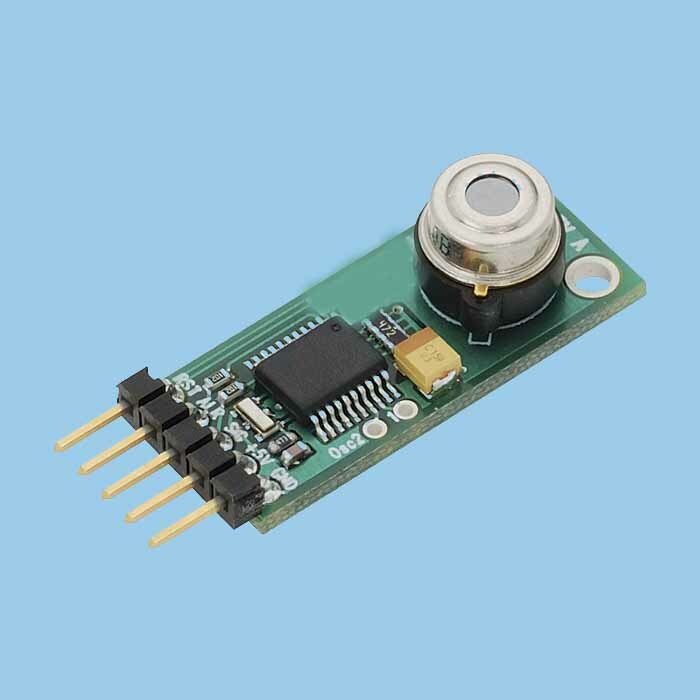 This sensor is perfect for any number of applications that require you to perform measurements between moving or stationary objects. Naturally, robotics applications are very popular but you'll also find this product to be useful in security systems or as an infrared replacement if so desired. The PIR Sensor detects motion up to 20 feet away by using a Fresnel lens and infrared-sensitive element to detect changing patterns of passive infrared emitted by objects in its vicinity. Inexpensive and easy to use, it's ideal for alarm systems, motion-activated lighting, holiday props, and robotics applications. 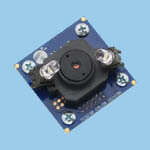 A complete color detector, including a sensor chip, white LEDs, collimator lens, and standoffs to set the optimum sensing distance. The sensor has an array of photodetectors, each with either a red, green, or blue filter, or no filter (clear). The filters of each color are distributed evenly throughout the array to eliminate location bias among the colors. Internal to the device is an oscillator which produces a square-wave output whose frequency is proportional to the intensity of the chosen color. The sensor can detect and measure a nearly limitless range of visible colors. Applications include test strip reading, sorting by color, ambient light sensing and calibration, and color matching, to name just a few. The programmable light-to-frequency converter combines a configurable silicon photodiode and a current-to-frequency converter on single monolithic CMOS integrated circuits. The output can be either a pulse train or a square wave with frequency directly proportional to light intensity. The sensitivity of the device is selectable and the output frequency can be scaled by one of four preset values. An output enable (OE) is provided that places the output in the high-impedance state for multiple-unit sharing of a microcontroller input line. It is a smart sensor for both humidity and temperature, and it comes in a tiny package that incorporates the analog to digital interface. All that the microcontroller has to do is read out the humidity and temperature values through the two-wire digital serial interface. The only math required is a simple scale and offset. It is factory calibrated so that it returns temperature with a resolution of 0.01 degrees Celsius and relative humidity with a resolution of 0.03 percent. The accuracy is better than most other sensors too. Excellent for commercial or home-based projects that require such readings. 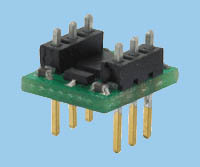 This Module is an intelligent non-contact temperature sensor with a single pin serial interface for connection to most microcontrollers. The sensor is designed for non-contact temperature measurements of objects placed within the sensor’s cone of detection. The sensor is comprised of an integrated ASIC and infrared sensitive thermopile detector. 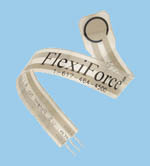 The FlexiForce sensor measures force between two surfaces. The sensor output exhibits a high degree of linearity, low hysteresis and minimal drift compared to other thin-film force sensors. The single element sensor acts as a resistor in an electrical circuit. When the sensor is unloaded, its resistance is very high. Resistance decreases when force is applied to the sensor. The sensor has an ideal output for A/D conversion - 0V is no force and 4.2V is 100 lbs. The active sensing area is a .375" diameter circle at the end of the sensor. The conductive leads are easy to connect to a breadboard or through-hole area. This module will let your robot / machine speak, provide a real human-console interface to your control system, or simply provide some entertainment to your microcontroller projects. This device intelligently handles values, sentences, numbers and common abbreviations with an extremely natural female voice with simple serial string sentences. Easy-interface SIP format 2.0" long x 1.375"